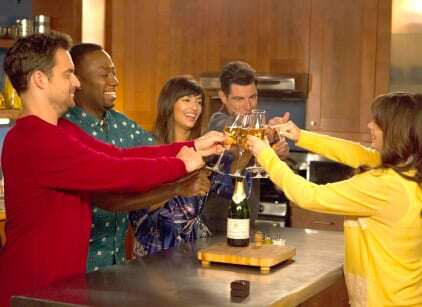 On New Girl Season 5 Episode 1, Jess decides to secretly invite Cece's mom to hers and Schmidt's engagement party, but doesn't realize Cece never told her mom about the engagement. Schmidt sends Nick to go get Cece's mom and Jess tries to get him to stall her until Cece can come up with a plan. Unfortunately, Nick ends up picking up the wrong woman and Cece's mom makes her way to the engagement party via taxi cab. When Cece's mom arrives, Cece tries to explain her engagement to Schmidt, but her mom doesn't want to hear anymore and tells Cece's she is making a terrible mistake. While Cece is trying to reason with her mom, Jess decides to debut an elaborate Bollywood dance she had been working on to surprise Cece, and her mom, and Schmidt puts himself into the performance. The dance doesn't sway Cece's mom at all and she reaffirms she won't be giving her blessing to the wedding. In the end, Winston, Jess and Nick all stand up for Cece and Schmidt and give their own blessing to the union since Cece's mom won't. The friends vow to be there for the the couple and Schmidt has a new plan for the wedding which revolves around the friends being the main focus.